Wealth is a crucially important measure of economic health—it allows families to transfer income earned in the past to meet spending demands in the future, such as by building up savings to finance a child’s college education. 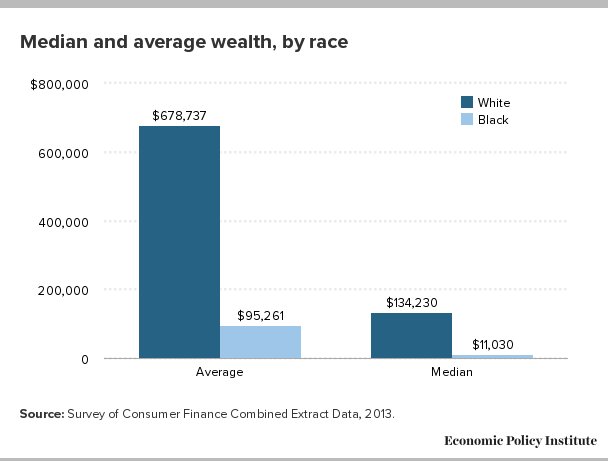 That’s why it’s so alarming to see that, today still, the median white American family has twelve times the wealth that their black counterparts have. And that only begins to tell the story of how deeply racism has defined American economic history. Enter EPI Distinguished Fellow Richard Rothstein’s widely praised book, “The Color of Law,” which delves into the very tangible but underappreciated root of the problem: systemic, legalized housing discrimination over a period of three decades—starting in the 1940s—prevented black families from having a piece of the American Dream of homeownership. Source: Survey of Consumer Finance Combined Extract Data, 2013. Director Mark Lopez uses innovative visual techniques to walk the viewer through Rothstein’s story, and the results are moving and compelling. “African American families that were prohibited from buying homes in the suburbs in the 1940s and 50s, and even into the 1960s, by the Federal Housing Administration gained none of the equity appreciation that whites gained,” Rothstein says in the short film. The discrimination happened on several levels—and often culminated in violence against black families trying to move into neighborhoods that had been effectively designated as white by government policy. Sometimes these designations took place quite literally as maps were divided up along racial lines with different colors on the maps. Black neighborhoods were painted red—hence the term “redlining”—which only became illegal after the Fair Housing Act of 1968. “If we understand the accurate history—that racially segregated patterns in every metropolitan area like St. Louis were created by de jure segregation—racially explicit policy on the part of federal, state, and local governments designed to segregate metropolitan areas, then we can understand we have an unconstitutional residential landscape,” Rothstein says.